(HARLINGEN) – There has been extra sawing, cutting and sanding going on at the Texas State Technical College Building Construction Technology workshop with students from the Migrant Academic Achievement Residential Summer (MAARS) program completing their projects. For Kimberly Muniz these sights and sounds bring back memories, yet represent her present. 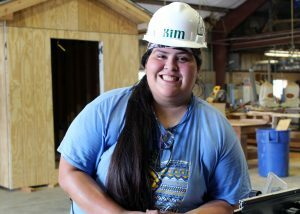 The Raymondville native was part of the MAARS program, a six-week camp designed to meet the needs of high school migrant and seasonal farm workers in pursuing higher education, in 2015 and 2016 as a student at Lyford High School and is now a student in the Building Construction Technology program at TSTC. Before MAARS, the 19-year-old had plans to attend a four-year university to pursue a degree in kinesiology and now she hopes to find a good paying job in the construction industry and opening a cabinet and furniture business. This year, more than 50 high school juniors and seniors from Cameron, Hidalgo and Willacy counties are participating in the program and living on campus. MAARS gives students two major opportunities: to receive two academic high school credits in an attempt to prevent them from falling behind or to allow them to get ahead in school, and to receive exposure to TSTC’s technical programs and college life. Yvette Mendoza, TSTC College Readiness coordinator, said their goal for MAARS is to show students that college is possible and to give them the information they need to make an informed decision about their secondary education. “It’s great seeing our MAARS students take the next step in their education after high school and realize that they can get a college degree,” Mendoza said. Irma Padilla, a San Benito High School senior, is one of this year’s MAARS students and said she has enjoyed every aspect of the program. The 16-year-old also said the highlight for her was making a night stand that she gets to keep during her time in Building Construction Technology. Students like Padilla not only experience two technical programs, three weeks each, such as building construction, Precision Machining Technology, Computer Maintenance Technology, Business Management Technology and Biomedical Equipment Technology, but they also participate in community service projects and have fun on the weekends with events and outings planned by Mendoza and her team. For more information on the MAARS program, call 956-364-4464. This entry was posted in Harlingen on July 9, 2018 by Amanda Sotelo Sotelo.